Now, Elisa Alfonzo, an official with the Mexican-American Legal Defense and Education Fund said MALDEF is putting a map before the council that would keep the Chinatown and Back of the Yards communities intact and keep both sides happy. “There’s a loss of population, yet we’re able to keep 18 Black districts; not losing anything. We have increased the Latino wards as numbers dictate and we just feel that this map should be an idea for the City Council to look at,” Alfonzo said. 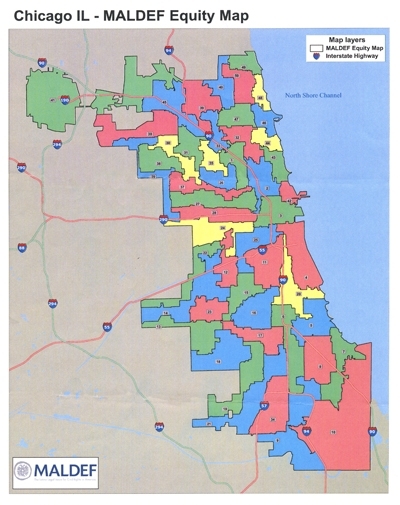 Although it’s unlikely, Alfonzo said MALDEF’s proposed ward map could be a compromise between those proposed by the Black and Latino caucuses. “There’s a way of doing … of drawing a map legally, but not sacrificing one community for another,” Alfonzo said. I hear that there is a remap hearing at DePaul University that was either held yesterday or to be convened next Wednesday January 11th. Is there an official posting anywhere about it? 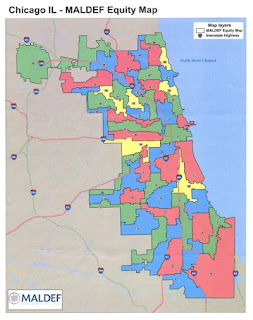 The chicagoredistricting.com website is utterly useless! UPDATE 10:20 AM Do you want to see the MALDEF map? Here's it is from Greg Hinz of Crain's Chicago Business! Roseland Heights may like this map although a good chunk of this 6th ward almost the same portion would still be drawn into the 9th ward. It looks like the 6th ward would still go into Englewood and the Washington Park or Woodlawn areas as well. UPDATE 10:36 PM You can look at PDF versions of this map from MALDEF's offical website! You will need Adobe reader to view this map. Sooner or later I'm sure someone will attempt to create a street grid version of this map.